A sturdy self-propelled gas mower from Craftsman, this machine effectively mulches, bags, or discharges clippings. The rear wheel drive provides better traction than front wheel. We were satisfied with the spring-loaded height adjustment system, which makes changing the height of each wheel a simple process. While this is a fairly noisy mower at 93 decibels, it has a powerful motor and variable drive that makes it easy to maneuver over varied terrains. 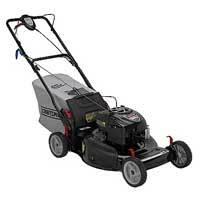 A moderately priced mower at $350, it also features a wide deck, making the mowing process go faster.